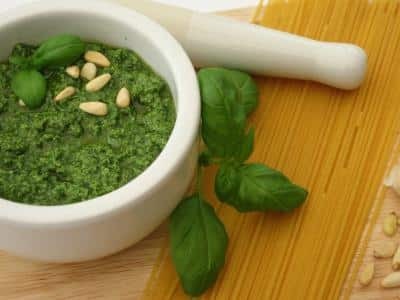 For a while now, I’ve been looking for a good Weight Watchers Pesto Recipe that still had all the flavor, but with less PointsPlus. After playing around with a combination of a few recipes, I finally came up with one that turned out really well, yet didn’t sacrifice the pine nuts, the Parmesan or the olive oil….these are 3 staples in a traditional pesto recipe, and I felt that they could not be sacrificed. However, by reducing the amounts of those ingredients, and increasing the amounts of the lower calorie ingredients, I was able to get the end result at just 2 Points for a 1/4 cup serving! Since pesto is pretty powerful, and not much is needed to deliver it’s fabulous flavor, I feel that this is seriously a great bargain. Try this recipe yourself, and serve it over chicken, fish, roasted veggies, 0 Calorie Miracle Noodles, or as a dip for some low calorie breadsticks. Ah, the possibilities are endless. If you are a Weight Watcher who loves pesto sauce, this recipe is a must try. This healthier, low calorie version of a traditional pesto sauce recipe, is a truly a force to be reckoned with. Enjoy all the flavors you love, but with just 2 Points for each 1/4 cup serving. Serve it over chicken, fish, pasta, pizza…whatever your pesto loving heart desires. And indulge, knowing that this easy pesto sauce is guilt free! Place all ingredients into a food processor and blend to desired consistency. Refrigerate or freeze until ready to use. Love!!! Just made.. with a timely tweak.. I had a yellow pepper on its last day… and 1/2 a red onion. I sautéed with some cherry tomatoes (also clinging to life) and put those in the food processor with the garlic and herbs! Omgoodness! The flavor from parsley/basil was outstanding! I didn’t miss the extra parm/olive oil at all! New staple! Thank you thank you thank you! This is so delicious! I was making a high calorie, high points plus pasta salad and with your pesto sauce and a couple other tweaks I was able to make a delicious, 5 point per cup pasta salad. Your recipe is delicious, light, and flavorful. Will be making again and again. I just ate this and it’s SO good! Even better than regular pesto, because it’s not oily. I made english muffin pesto pizza with lowfat cheese. Only thing is, I calculated and got 3, not 2 using the ww recipe builder. Still totally doable, but just wanted to make the correction on the points + value. How can this be Vegan is there is Parmesan cheese ?? I was searching for vegan ww recipes when I came across this site. While this does look tasty, Parmesan cheese is NOT vegan. Thanks for catching that it – my mistake! It should just be categorized as a Vegetarian Weight Watchers Recipe, not Vegan. I've just corrected it. IT DOES SOUND DELICIOUS BUT WHY ALL THE EXTRA INGREDIENTS ?? I do like the idea of the broth in case the pesto is too thick, instead of using more oil. Thanks for sharing, Sally! The extra ingredients help increase the quantity and flavor of the sauce, without increasing the Points + value.